The mums are in full bloom in Kansas. Not only is it beautiful, I am hoping it is a sign that the heat will be ending! Our kids have been in school a few weeks and it is a great time to let your teachers know that you are thankful for their hard work. So grab some mums and tie on this printable gift tag and you have a perfect teacher appreciation gift! I hope Fall is on its way…..how about you? thank you for the pintables! Hi! I've been using this mum printable for a couple years now...love it! However, I'm having a hard time finding where I can print it out. I see the small photo of it, but it's not letting me print? Just takes me to other pages within the site? I love your web site (Skip To My Lou). I look forward every week to this. Keep up the fantastic job!!!! I love this and would also love another tag option, maybe saying you are a great friend? Thanks! I'm not able to find the printable for this tag. I was hoping to give this gift to my children's teachers before fall break. Can you help me find it? I was hoping to just change the last word-teacher to office staff and/or librarian so I could give mums to those not technically teachers. Thanks. I love this site! Love these but wanted to include the office staff also. Is there a way to edit the writing from your printables? Barbara, what would you want it ti say? I am happy to edit, maybe others would like it too! This is a super cute idea! 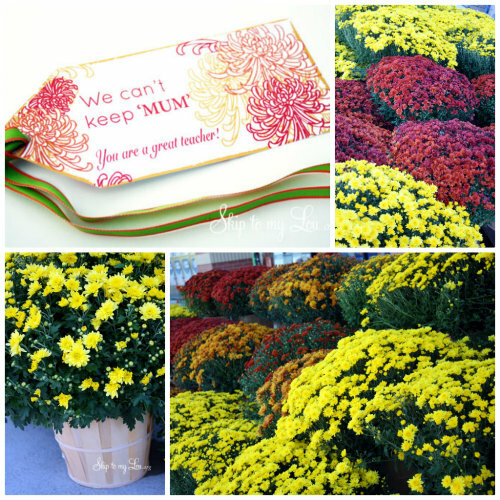 I love mums and they are so perfect for fall. The little tag is really adorable. This is a great idea. Like you, I am glad fall is on its way. I do not like heat.